This is not the first time the two politicians have butted heads. 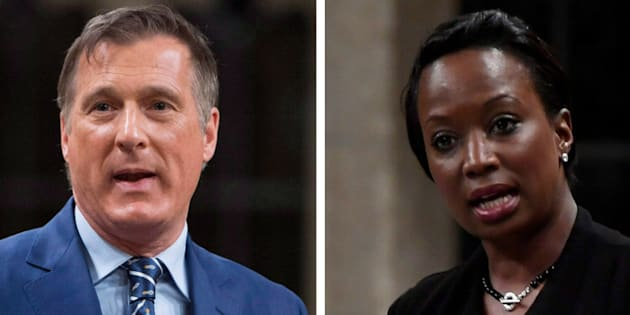 Conservative MP Maxime Bernier accuses Liberal MP Celina Caesar-Chavannes of focusing too much on race. OTTAWA — Conservative MP Maxime Bernier has reproached a fellow MP for being too focused on the colour of her skin. On Twitter Saturday, he accused Liberal MP Celina Caesar-Chavannes, who is black, of thinking "the world revolves around (her) skin colour." Bernier was reacting to a Globe and Mail article in which the author says Caesar-Chavannes "focuses less on policy and more on personal matters."
. @MPCelina "focuses less on policy and more on personal matters." That's the main difference between us. You think the world revolves around your skin colour. My goal is to bring better policies to all Canadians. That's an MP's job. Bernier quoted that passage in his tweet, adding that it's an approach vastly different from his own. "That's the main difference between us," he wrote. "You think the world revolves around your skin colour. My goal is to bring better policies to all Canadians. That's an MP's job." Caesar-Chavannes responded with a message of her own in which she pointed out that she deals with policy on a daily basis. "Unlike you however, I can focus on policy while also shifting the status quo and increasing awareness," wrote the MP from Whitby, Ont. "That's what happens when you #AddWomen. We get more done!" This is not the first time the two MPs have tangled on Twitter. They had a heated exchange in March after Bernier criticized the government's decision to set aside funds in the budget for programs designed for Canadians with minority backgrounds. Caesar-Chavannes, who has been outspoken on issues of race, responded with a message on Twitter in which she told Bernier to "check your privilege and be quiet." She later apologized for telling Bernier to be quiet and offered to meet him to discuss the issue in person — an invitation Bernier declined. Caesar-Chavannes returned to the issue in the Globe interview, explaining that Bernier's privilege is that he won't ever know what it's like to "live with colour. "You sit there and say you don't see it. Well, good for you, because you've never had to experience it, sweetheart," the newspaper quoted her as saying. That term of endearment was one Bernier did not appear to appreciate, judging by his Twitter response on Saturday. "By the way, I'm not your 'sweetheart,'" he wrote.